Radicalized by World War I and its aftermath, Eternal Wanderers comprises part of a series of Segall paintings of the victims of war that also included Kaddish, Widows, Arme Kinder (Abandoned Children, c. 1918) and Tot (Death, c. 1918), that relied on visual and ideological tropes of “primitive” savagery to charge the compositions with an underlying tone of brutality and dehumanization. 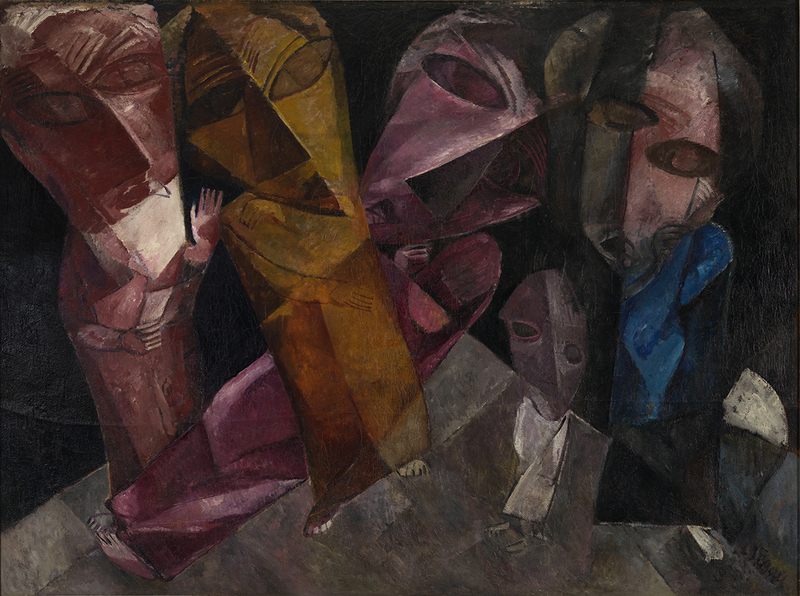 Eternal Wanderers depicts a chaotic group of figures, faces distorted in anguished masks, situated in an inhospitable and irrational environment. They amble unsteadily on an uncomfortably foreshortened ground plane, poised between standing and falling. Their vacant, sorrowful eyes and contorted mouths betray a sense of grief and horror, exacerbated by the existential darkness behind them.